Background: Treatments of patients with amlodipine (a calcium channel blocker, CCB) overdose/poisoning remain challenging and death is certain if not intervened timely. Furthermore, for the society, the availability and common use of this drug can drive more vulnerable groups, especially children, towards an accidental/suicidal poisoning. 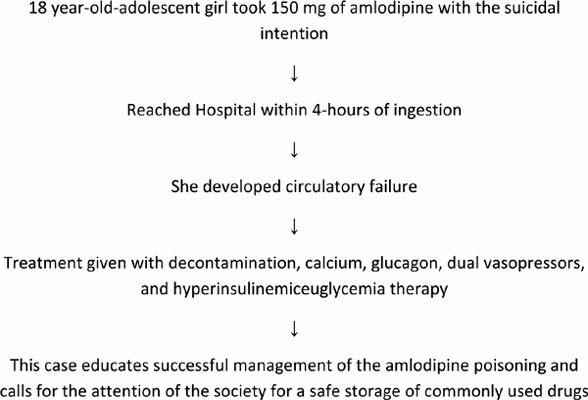 Case Report: Herein, we describe the case of an 18 year-old-adolescent girl who took 150 mg of amlodipine with the suicidal intentions and was admitted in our hospital approximately 4-hours after the ingestion. She developed circulatory failure and tachypnea. Decontamination, calcium, glucagon, and dual vasopressors were started, however, persistent hypotension led to the initiation of hyperinsulinemiceuglycemia therapy. She recovered fully and discharged without any complications in few days. This case educates not only about the successful use of variant drugs in the management of CCB overdose/poisoning, but also calls for the attention of the society for a safe storage of often used drugs, especially away from the children/adolescents. Keywords: CCB, hyperinsulemiceuglycemic therapy, overdose, suicide intention, refractory shock, inotrope. Keywords:CCB, hyperinsulemiceuglycemic therapy, overdose, suicide intention, refractory shock, inotrope. Abstract:Background: Treatments of patients with amlodipine (a calcium channel blocker, CCB) overdose/poisoning remain challenging and death is certain if not intervened timely. Furthermore, for the society, the availability and common use of this drug can drive more vulnerable groups, especially children, towards an accidental/suicidal poisoning. Rapid Desensitization of Hypersensitivity Reactions to Chemotherapy Agents.